We've simplified printing for high page count PDF's of Open Educational Resources (#OER), Creative Commons licensed works, titles in the Public Domain, and user-created & their digital materials licensed to print. Our service gets these documents to your domestic US mailbox, or your customers, conveniently. Professionally printed and packaged. PDF's everyone wants to use in print, on paper. 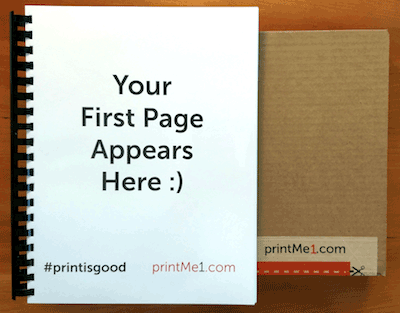 We are an easy way to print and distribute these documents. Print has unique benefits too. Published research in Scientific American ("The Reading Brain in the Digital Age: The Science of Paper versus Screens" by Ferris Jabr, April 2013,) has found that memory benefits more from using print for reading instead of electronic formats. We have also created a list of articles on this subject and posted it to our blog here. Our site is also a simple way for authors to distribute their works to others without going through a complicated store set-up. Sell your works on your own site, and then use ours to distribute simply by changing the shipping address in Paypal for each order. It's a convenient way to distribute for occasional orders. Do you have a special situation you would like our help with? Just let us know through our Contact Us page and we will get in touch. Follow our blog, google+ & facebook pages above for news, tips, and articles.